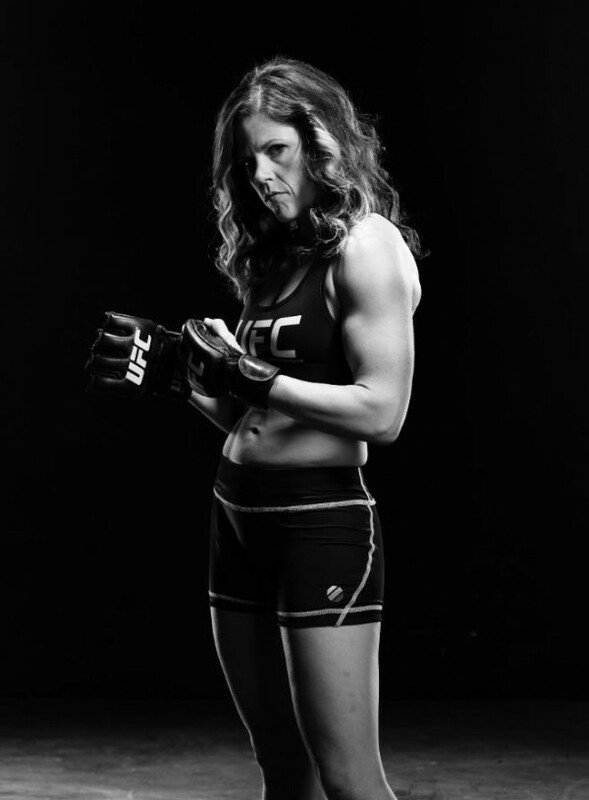 Bangor native Emily Peters Kagan is competing on the 20th season of "The Ultimate Fighter." Ronda Rousey (center) reacts with her corner after defeating Miesha Tate (not pictured) in their UFC women's bantamweight championship bout at the MGM Grand Garden Arena. Emily Peters Kagan greeted the news that she had been selected to compete in Season 20 of “The Ultimate Fighter” reality television series with a fair dose of Down East skepticism. “When [Ultimate Fighting Championship president and part-time Levant resident] Dana White called me, I really wasn’t sure whether to believe it or not,” said Kagan, a 33-year-old mixed martial arts professional and Bangor native. “It took me a minute to realize that it was him. Kagan is one of 16 women competing in “The Ultimate Fighter” season 20 not only for the show’s bragging rights, but to become the first champion of the newly created UFC women’s strawweight division. The filming for the series — the first “The Ultimate Fighter” season involving an all-women cast — was completed in mid-August and is set to air on Fox Sports 1 beginning with the two-hour premiere at 10 p.m. Wednesday. The show then runs weekly until the live finale in Las Vegas on Dec. 12. “I know that this season is going to be one of a kind, truly amazing,” said Kagan, who was flown back to her hometown to promote the show during FSN1’s Aug. 16 live telecast of UFC Fight Night 47 from the Cross Insurance Center in Bangor. Despite sagging television ratings for recent seasons of “The Ultimate Fighter,” White is optimistic about the latest edition because of the growing popularity of the UFC’s women’s bantamweight division and, in particular, undefeated champion Ronda Rousey. Kagan, the granddaughter of well-known Bangor-area businessman Irving Kagan, lived in the Queen City until age 11. She went on to graduate from Deering High School in Portland. Her introduction to martial arts came when she joined a jiu-jitsu club while attending Goucher College in Towson, Maryland. By the time she graduated with a degree in international business she also earned her black belt in traditional Japanese jiu-jitsu. A subsequent job in Israel not only expanded her geographic resume but her martial arts portfolio as well, when she took up several other disciplines, including a more modern form of Japanese jiu-jitsu, Muay Thai, boxing and various forms of grappling. Kagan moved back to Maine in 2006 and spent more than two years training in mixed martial arts at the Team Irish MMA Fitness Academy under then-UFC contender Marcus Davis, who encouraged her to pursue the sport further. Kagan’s debut bout came in 2010, just three months after her arrival at Jackson’s MMA. She went on to compile a 5-2 amateur record before turning professional in September 2012. Kagan scored a three-round unanimous decision over Lynae Lovato in her pro debut, then won a split decision over Glena Davis a month later before signing with the fledgling Invicta FC women’s MMA promotion. She split her next two fights before White purchased the contracts of Kagan and 10 other Invicta FC competitors late last year with the idea of adding a 115-pound women’s division in the UFC to go with the already established bantamweight division. Less than a year later, Kagan is poised to be featured internationally on a reality television series with a world championship at stake. “It has been fast, but I wouldn’t have had it any other way,” she said. “I’m feeling very excited, very blessed to be part of this. It’s very consistent with how I identify myself as a person, a professional really wanting to promote women and being a part of educating new MMA fans on other aspects of the sport. Kagan believes the blend of competitors on the television series will add to its appeal. “We are a medley of personalities, for sure, from all walks of life but with enough similarities — probably through our pursuits and following our dreams — that we are able to make alliances and friendships,” she said. It’s also an opportunity, Kagan said, to further establish mixed martial arts as a viable athletic option for women.